If you have ever visited any of our locations one thing you will immediately see is hundreds of "test" samples to review. Usually our sales team is pushing our production team to find new and creative ways to improve any or all of our decoration techniques. last week on our weekly conference call it was put into action. It is well known that CFpromo is THE place to get your custom discharged prints with water based ink! 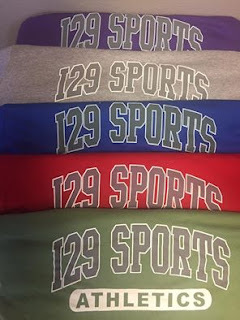 Heck you may even by lucky enough to ask for and recieve a FREE I29 Sports version!!! We call them the SOFTEST prints on the planet and that's no joke. 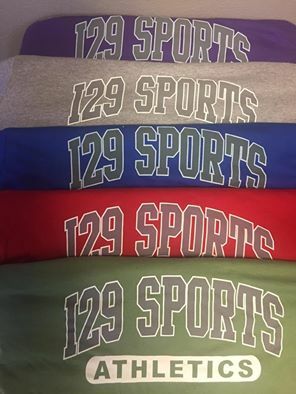 However the process is complicated and we were told impossible to do on shirt colors with darker dyes like blue, purple, red, etc. Well here is the image of the test prints so you can decide for yourself! Thanks Team Production for never taking no for an answer! 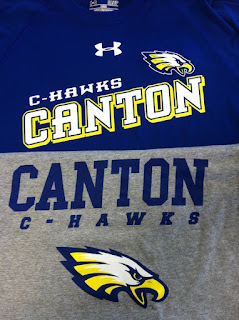 Not only are CFpromo/I29 Sports web stores easy, convenient and the simplest way to show your school spirit and support school activities.....but the finished products look tremendous, are on time and always with the best pricing on the planet, just like this image of a few items from the recent store for the C-Hawks of Canton!